Part of the real financial crisis from the central bank perspective is that they have been trapped by the excessively low-interest rates that in reality has disarmed them from even trying to steer the economy. The bid on long-term rates has been strong over the last decade thanks to retirement plans. People have been just trying to lock in guaranteed rates of return even when under 3%. Just as Volcker went crazy pushing rates to nearly 20% in 1981, the banks scared the hell out of the central bankers and they pushed rates excessively to the downside. That has relieved the central banks of any leverage to try to manipulate the economy during the next downturn. They KNOW that and are frightened to death about what comes next – hence negative interest rates theory. We must also realize that the trend toward rising taxation has historically also had a major impact upon interest rates. Politicians have NEVER taken taxation into account. They see taxes as their divine right. Britain is hiring judges as they expect greater legal challenges to their new offensive on tax collection. The battle cry is get the tax avoiders at all costs. They fail to grasp that this will also have an impact upon long-term rates. The yield-curve has been altered several times between taxation and war. 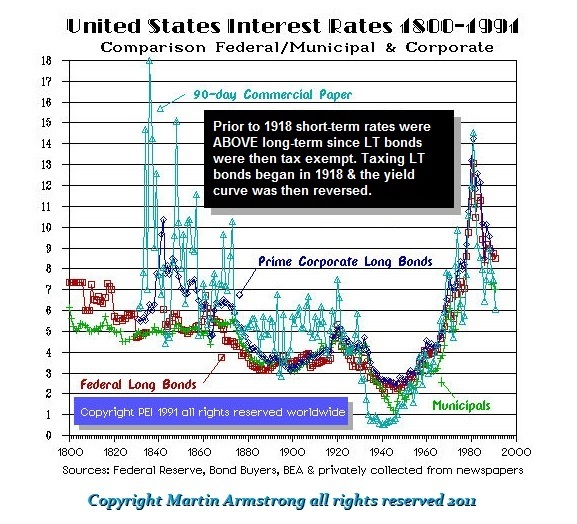 When short-term interest rates became taxed in 1918, they rose sharply and that contributed to the Crash of 1919. 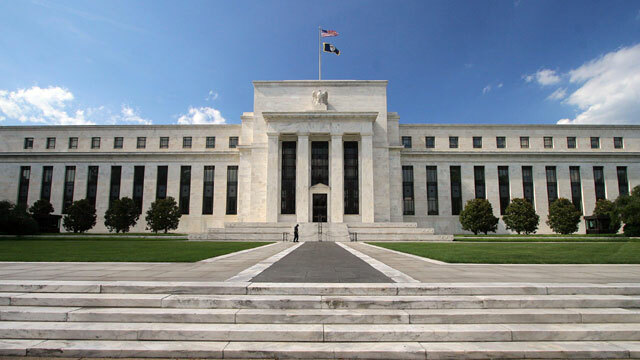 Consequently, the Fed’s intention to eliminate its long-term debt buying in the autumn has too many central bankers anticipating that long-term rates will then start to rise sharply when the Fed’s buying has been really minimal – a drop in the bucket within the global economy. As a direct result, many central banks are starting to sell their long-end expecting rates to rise both in US and UK. This will no doubt contribute to a modest rate rise into the end of next year on the long-end given the bid for mortgages as well. However, the bid from the pension side will cap rates more so than it has in the past. Nonetheless, this toxic cocktail that is starting to unfold is more likely than not going to produce a serious crisis in government debt between 2016 and 2020 where they will be unable to sell long-term as more and more pension funds are driven into insolvency. The bid from the long-term buyers is going to reverse and with it, government debt will become highly volatile on the short-end. As taxation rises, capital invests based entirely upon NET RETURN. The greater the tax increase the higher the gross interest rates will rise. The pension funds tend to be more conservative and as a result they will be the next great crisis as insolvency starts to rise as they have been unable to meet their obligations. Governments are going to find the traditional flight to quality reverse as more and more capital shifts to the private sector fearing even the economic data published by governments is not trustworthy for they will play with the numbers to support their position of control.